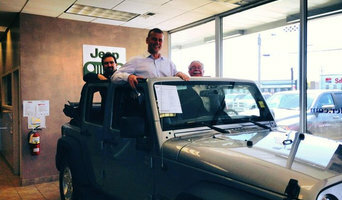 Leduc Chrysler has been Alberta's no-hassles, no-nonsense dealer since 1952. We make it easy to buy: we provide shuttle service, loaner cars, and free delivery in Alberta. With our close proximity to Edmonton Airport, we have a Fly & Buy program that makes it easier to pick up your new car or truck. As distinct as the region it serves, Western Living Magazine informs and entertains sophisticated, active engaged urban readers on home design, décor, food, wine & travel. Combining stunning photography with exclusively Western Canadian sources for living a stylish life in your home. Align Digital Marketing is a full-service marketing agency. Our services include SEO, PPC, social media management, web-design and reputation management. In 2012 we began providing high quality eye care to patients in the region. We are committed to serving you throughout your visit, and even after you leave our office. Our staff delivers exceptional customer service assuring you the respect and attention that we would show our own family and friends. Our experienced doctors will assist you in selecting frames and lenses that best help you achieve and maintain optimal vision. We know your time is valuable and that healthy eyesight is important to you and your family. At Westhealth Eye Care, we strive to not only meet your expectations, but to exceed them. We carry a large selection of designer brands and offer a variety of frames to choose from. Please call us today to schedule your appointment. Appointments are now being accepted. NGO with the mission to provide education on creating financially sustainable housing and communities. From Miu Miu to 'Ma Ma': One fun and fearless female's adventures in modern motherhood. Currently renovating our small town house into our family's forever home. We look to regional, national and international interior design blogs and other media — such as Alberta magazines, newspapers, books and websites — for the latest in trends on home decorating and design. In addition to providing information on what's new in the design world, they can inspire you to take action in your own home, provide resources for learning more about design fundamentals and help you get inspired for a future home improvement project. Journalists and bloggers work to convey as much useful information to their readers as possible. Whether they provide an in-depth look at a new development in the world of design, research on the best Nisku, AB vendors and resources for purchasing home furnishings, step-by-step instructions for completing a home improvement project successfully from start to finish, or inspiring images and thoughts on styles and trends in the home, blogs and other media provide endless resources for people interested in home design. Here are some related professionals and vendors to complement the work of media & bloggers: Photographers, Interior Designers & Decorators, Architects & Building Designers.